Hint: Log on in just 2 weeks from now to hear about a new project I am working on. I am so excited about it, I can hardly wait to share and I hope you want to participate with me (more news to come later). This is Thanksgiving week and I have so much to be thankful for. Especially this year I believe it is for my precious little 2-month-old granddaughter. 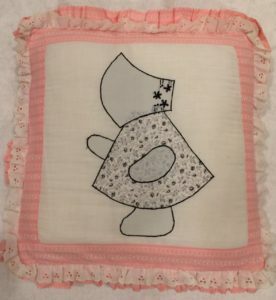 Because of her, I have been thinking of things girly and wanted to share a few Sun Bonnet Sue Quilts from my doll quilt collection. The first one is a sweet quilt I found in an antique shop. It is about 20” x 24” and has charming little Sues in pink with Blue Bonnets. The next one is about the same size but probably my favorite and I found it on E-Bay. It is hand pieced, embroidered and hand quilted with a nice yellow border. They just don’t come much better. 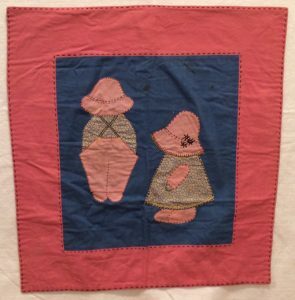 This fun little pink and blue Sun Bonnet Sue with her friend Overall Sam were also an E-Bay find. You just never know w hat will turn up when you look there. The last one I wanted to show you has a little story. This picture is of a pillow with Sun Bonnet Su e and she matches a special quilt. It started with my grandmother and great grandmother. 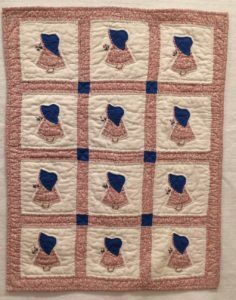 When my mom was a little girl they decided to work on a quilt together and made her a Sun Bonnet Sue quilt that they set on feed sacks when my mom was about 5 years old (she’s 92 now). About 10 years ago, my mom gave me that quilt for my collection and I treasure it! But to continue the tradition, when my little girl was about two years old (she’s 39 now) and needed a quilt for her big girl bed my mom suggested that we make a mother/grandmother quilt like the one that had been made for her so we did! And this pillow went along with it. 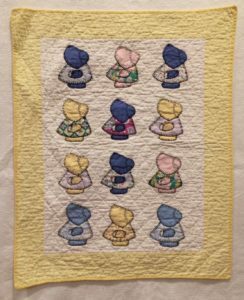 I still think it is a wonderful tradition in quilting families for mom and grandma to collaborate on a special quilt for a young daughter/granddaughter.